In spite of a recent baby boom and the return of many emigrants, Ireland's population is still not as large today as it was in 1841, at the outset of the potato famine. Limerick was sacked so many times in the 17th century it was once known as the "city of sieges." In more recent history it has had so many gang killings it’s become known as "stab city." For the first time in a decade, the number of “Travellers" (once known as “Tinkers") living on Ireland’s roadsides actually increased in 2006, The Irish Times reports. According the Vintners’ Federation of Ireland, rural pubs are now closing at a rate of one every day due to a combination of high costs, the smoking ban and tougher laws against driving while intoxicated. Overdevelopment in the Galway area has caused such a serious pollution problem in Galway Bay that the government has told people in the area to avoid drinking tap water and prevent babies being bathed in tap water from allowing it to touch their lips. Owen Nolan, currently with the Calgary Flames, is the only Irish-born player in the National Hockey League. Nolan, whose middle name is Liam, was born in Belfast. Sales of Guinness Stout have been falling in recent years, but Irish Whiskey is hot hot hot. Sales of whiskey from the old sod jumped 130% between 1994 and 2005, according to the Distilled Spirits Council of the United States. Demographers predict that Ireland's population of people over 60 years of age will double in the next 30 years, placing tremendous stress on government and social service programs. In a recent national survey conducted for Catholic and Protestant organizations, only 5 per cent of Irish 15 to 24-year-olds could quote the first commandment. About one-third didn't know where Jesus was born, and amazingly, 35 per cent said they did not even know what is being celebrated on Easter. Interest in Irish-speaking schools has exploded in Ireland in recent years. Almost 65 "Gaelschoils" have opened in the last decade, and many have long waiting lists of students wanting to get in. Currently, there are 8 times as many people who speak Polish in Ireland as people who speak Gaelic. Ireland is ninth the ninth most oil-dependent economy in the world. Bertie Ahern is sometimes called the “Teflon Taoiseach" after surviving a political scandal he survived in 2006, when loans he received from friends when he was finance minister in the 1990’s came under scrutiny. Henry McCullough, the lead guitarist in Joe Cocker’s band, was the only Irishman who played at the original Woodstock music festival. by law, permitted to hold political office in the Republic of Ireland. A popular online guidebook, The Lonely Planet Bluelist, recently named Northern Ireland as one of the world’s “must see" destinations for 2007. Ireland now exports 14% of its gross domestic product to the United States. That’s much more than any other European Union country. Economists say this makes Ireland extremely vulnerable to any economic slowdown in America. The Irish Times reports that Lucy and James are currently the most common names being given to newborn Irish children. The names Daniel and Sophie come in a close second. Bad Number: The number of drunk drivers caught in Ireland rose 23% in the first six months of this year, versus the first six months of 2005. Good Number: More than 10,000 new companies were started in Ireland in the first six months of this year, a record performance by Irish entrepreneurs. Incredible Number: According to a recent Bank of Ireland report, Ireland is now the second wealthiest nation in the world, with over 30,000 millionaires. Because of population shifts towards big towns and cities, some parts of the countryside are increasingly populated only by old folks. Over one-third of the population in some Irish rural areas is now over 65 years of age. The first divorce ever granted by the Irish government was in 1997. MODERN IRELAND FACT: BEGADS HE SCORED!...An Irish jig was once played in Detroit's Joe Louis Arena every time Brendan Shanahan scored for the Red Wings. Shanahan is currently playing for the New York Rangers, who also occassionally play an Irish jig when he scores. All windmills in Ireland turn in a clockwise direction, while the rest of the windmills in the world turn counter-clockwise. Ole! About ten percent of County Roscommon's population is Brazilian today. The samba is danced in local clubs on "Brazil Nights" and one local radio station broadcasts in Portuguese on weekends. Irish police (gardai) have received increased government funding to battle a rising problem of armed gangs trading in drugs and stolen cars. The cities most affected have been Dublin, Sligo, and Limerick, and there have been problems in counties Clare, Tipperary and Cork. Brick-throwing between teenagers living in mixed Protestant and Catholic areas in Northern Ireland is still so common - and so pointless - that authorities sometimes refer to it as "recreational rioting." IRISH REAL ESTATE SCAM "Gazumphing" is the popular term for a nasty real estate practice in Ireland. Some Irish real estate agents or property owners have taken advantage of a soaring market by accepting a bid from one buyer, and then taking a higher bid while contracts are being processed. Some sellers have simply gone back to the first bidder demanding more money when a higher bid comes in. After a bid is accepted in Ireland, there’s normally a period of several months until ownership papers are finished. “Gazumph" is a Yiddish word meaning “to swindle." “Trocaire" is a widespread practice of giving during the Lent season in Ireland. It’s hard to call it a tradition, since it was only started in 1973 by Irish Catholic Bishops. But it’s certainly popular. Last year, over 10 million Euros were collected by children who brought small cardboard "Trocaire boxes" home to stuff with their parents’ extra cash. A majority of Irish people say they would vote in favor of the state allowing divorce if a referendum were held today, and most say that allowing divorce would not undermine the institution of marriage. There are now more cell phones in Ireland than people. Oddly, Ireland's average of 102 phones for every 100 people is lower than the European Union average of 107 phones per 100 people. Ireland is currently the world's largest exporter of software. That's largely because it's the point of export to all of Europe and the Middle East for Microsoft, IBM and other big American tech companies. About 100,000 Irish people are expected to come to New York City this year to do their Christmas shopping. If the dollar continues to weaken against the Euro, that number is expected to go even higher. The Irish Examiner announced this spring that Irish workers are, on average, losing up to seven years of sleep in their lives because of the time they spend driving to and from work. The three most sleep-deprived professions: 1) doctors, 2) company directors and 3) train drivers. Decide for yourself whether doctors or train-drivers scare you more. MODERN IRISH MONEYMEN: The Irish millionaire’s club is growing at a rate of 1,000 diamond-studded members each year. There are now more than 17,000 such rich folk in Ireland. Over 100,000 people ran in the 2006 Dublin Marathon. The number of North American tourists in Ireland is still not quite what it was before 9/11. According to Ireland’s Central Statistics Office, 977,000 Americans and Canadians visited the Republic in 2004, the most recent year measured. The high water mark of one million visitors in 2000 has yet to be equaled. Ireland today has the lowest unemployment rate of any country in the European Union. Former British Prime Minister Tony Blair’s mother was born in Ballyshannon, County Donegal. Ireland is not a member of NATO, but has been a member of the European Community since 1973. Comhaltas, the top organization for promoting Traditional Irish music, will get more than 25 million Euro from the Irish government over the next five years to keep people excited about playing classic Irish jigs and reels. It rains about twice as much in The West of Ireland as it does in The East. Clouds that come in off the Atlantic heavy with moisture tend to release as they hit the coast. Housing prices in Ireland have risen over 130 per cent in the past 10 years, the largest increase for any country in Europe. Youth movement. Ireland currently has the highest proportion of people under 25 of any member-state of the European Union. Ireland has the second highest number of lawyers per capita in the world - after the United States. Read "Ireland Goes Lawsuit Crazy"
This new house: Over one-third of all the houses now standing in Ireland have been built in the last nine years. Demographers predict that The Republic of Ireland's population, which only recently hit 4 million, will go above 5 million by 2030. Twenty five per cent of residents at that time are expected to be non Irish-born. Ireland is the most "globalized" country in the world according to a recent study by A.T. Kearney and Foreign Policy magazine. The country's high volume of trade with other nations and "personal contact" with people internationally (many of whom are connected to Ireland by family ties) were two key factors in gaining the #1 rating. "The Taking of Christ" by Caravaggio, which hangs in the National Gallery in Dublin, was “lost" for 60 years – hanging anonymously in a Jesuit monastery. It was recognized in 1990 by an art expert brought in to clean it. The painting, valued at over $30 million US, is on “indefinite loan" to the gallery from the Jesuits. Over 100 bottlenose dolphins live in the Shannon Estuary, on Ireland's west coast between the Kerry Head and Loop Head peninsulas. Read "Read "Loop Head - Clare's Secret Peninsula"
IRELAND FACT: DUBLIN IS EVERYWHERE...There are towns called Dublin in California, Georgia, Indiana, Maryland, New Hampshire, Ohio, Pennsylvania, Virginia and Texas. In 1941, Belfast was bombed several times by German aircraft. On one night, over 900 people were killed. The Republic of Ireland is about the same size as West Virginia. The Irish-American rock group "Black 47" is named for 1847, considered the very worst year of the potato famine in Ireland. During World War II, Hitler seriously considered invading Ireland, to use it as a platform for an assault on Britain. At the same time, the British repeatedly pressured Irish Taoiseach Eamon De Valera to give them use of the ports of Cobh, Berehaven and Lough Swilly for ships involved in their anti-submarine campaign in the Atlantic. De Valera refused, citing Ireland's neutrality in the war. 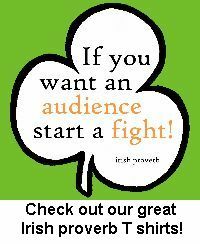 IRELAND FACT: A FORCE IN AMERICA...Between 40 and 44 million Americans claim some Irish ancestry, making them the second largest ethnic group in the US. People of German descent are the largest group. The first submarine in America's military was built by John Philip Holland, who emigrated to America from County Clare. Holland built his prototype, called the Holland VI, in Elizabeth, NJ and tested it in New Suffolk, on eastern Long Island, in 1899. The US Navy purchased it from him on April 11, 1900. IRELAND TODAY's ARMY: Ireland’s total full-time defense corps, including all army, navy and air corps personnel, numbers less than 14,000 people. All enlistment is voluntary. So long Irish siesta. Hour and a half lunch breaks, long a staple in laid-back Ireland, are fading fast as the economy booms. The Irish Post reports that about half of all Irish workers say they're now too busy to leave the workplace for lunch even once a week. The Irish Commission for Communications Regulation (ComReg) says their survey taken in the third quarter of 2006 shows that, for the first time, a majority of Irish people now use the Internet. An Irish bride’s family was once expected to foot the bill for the entire wedding (and often hand over some farming land to the groom as well). No more. Nowadays couples are seeking financial help from both sets of parents to put on the happy event. About 140,000 mink and several hundred foxes are raised and then killed for their pelts every year on Irish farms. Mink farming is illegal in Northern Ireland, and some groups are campaigning to have it outlawed in the republic due to harsh, confined conditions for animals. At upscale Longueville House in Mallow, County Cork, 5,000 pheasants are released onto the grounds each year for the pleasure of hunters. Read "The Accidental First-Class Tourists"